You’re working out intensely, when your headphones fall out. This isn’t the first time this has happened to you. Sadly, it ruins your mood and motivation. The problem? You chose the wrong pair. The best earbuds for working out are quite different from regular earbuds. Most of them are wireless to ensure you don’t have to worry about wires while performing your favorite workout. Another important feature is sweat resistance to ensure durability. Worried? Luckily for you, we have done all the research for you. Below are our top 8 best wireless earbuds for working out that will help you amp up your music and your performance. 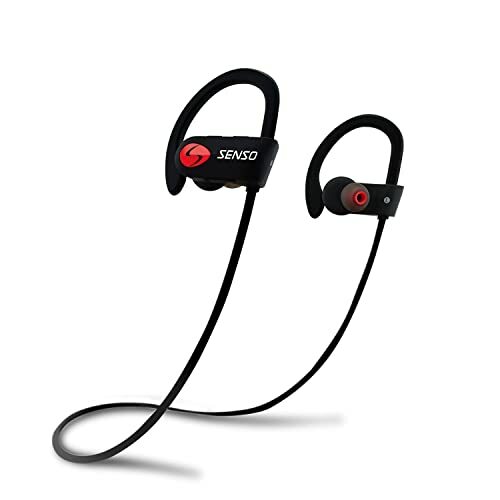 When it comes to the absolute best headphones for working out, there’s none that can beat the Senso Bluetooth Headphones. Their wireless operation and sweat-proof function make it easier to work out for hours on end. The high-quality earbuds feature Bluetooth 4.1 technology that easily connects to all devices up to 30 feet away. Also included are premium quality components that feature a noise suppression technology for the clearest sounds. Furthermore, the earbuds are quite ergonomic and comfortable. They feature an adjustable ear hook that secures the buds around the ear. So, you can jump, run and jog without worrying about them falling off. Also, since they’re wireless, you don’t have to worry about them tangling or the cord being long enough to reach your pocket. The wind reduction technology further ensures you can clearly hear the music. Not only this, but you can use it for long, high-intensity workouts as well. The Li-ion battery allows you to enjoy about 8 hours of music while the charging time is merely 1.5 hours. All in all, their waterproof, sweatproof, comfortable and secure design makes them perfect for working out. Otium Sports Earphones are perfect for every workout your trainer throws at you. With the latest Bluetooth technology, they ensure you can listen to music while performing other tasks. The 4.1 technology ensures a faster and more secure connection for lesser skips and breaks. For Otium, your comfort truly matters as is evident by the adjustable ear buds and ear hooks. The exclusive Stay-in-ear technology ensures that your earbuds always remain secure during workouts. The wireless design further allows for a hassle-proof operation. What’s more is that the Otium features easy to use and reach buttons that allow you to skip or play or pause the music. Furthermore, the built-in microphone allows you to use your phone without having to reach for it often. Also, these wireless earbuds are IPX 7 waterproof to protect the internal components from sweat. These barely take an hour to charge and provide up to 8 hours of playtime. Overall, these are great for folks looking for a durable and high-quality design. With a challenging workout, the Bose Soundsport Wireless Headphones ensure that you never have to face any challenges with your earphones. The earphones are specially designed for comfort and durability. The best part is that the audio is consistent and balanced, even at high volumes. The equalizer ensures that you can play the loudest music without any cracking. The Bluetooth and NFC pairing ensure a wireless operation that is further aided by voice notification and prompts. This makes it easier to operate the earphones. The Stay Hear+ tips add to the comfort and convenience of the headphones. These ear hooks are tiny as compared to the other models. In addition to this, the Bose earphones are sweat resistant to ensure reliability during the toughest workouts. The in-built mic, as well as the easy-to-use control buttons, allow you to control the music and receive incoming calls without reaching for your phone. Lastly, the 6 hour play time and the short charging time makes it truly an all-star. Where others boast fo being wireless, they still use wires as a neckband. 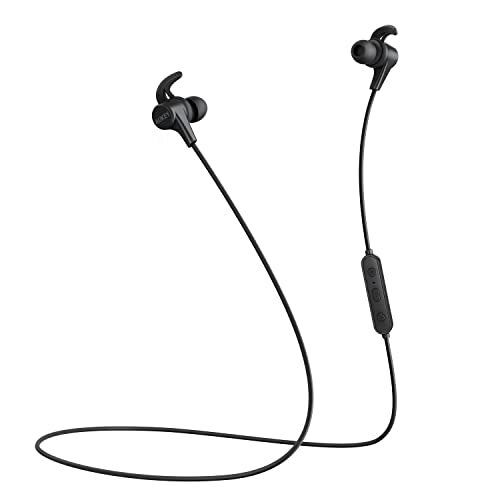 However, the Bose Soundsport Free Sports Headphones are truly wireless with no wires in sight. The total freedom of movement allows you to fully concentrate on your workout. Moreover, they are IPX4 rated for sweat and weather to protect the system from water and other fluids. In addition, the earbuds are available in about 3 different sizes to ensure everyone gets a perfect fit. Like the other Bose earbuds, these too come with ear hooks that are unnoticeable and small. Worried about losing the pair? 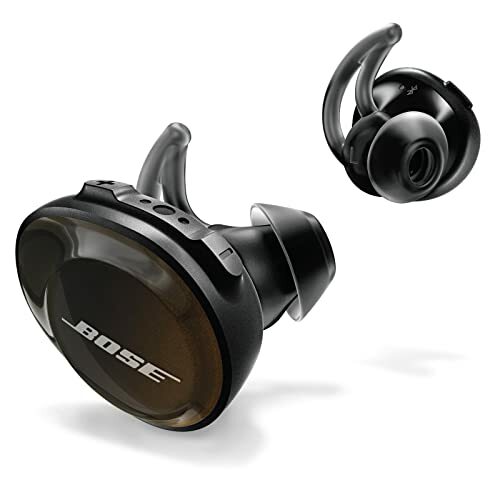 Luckily, Bose comes with a tracker that allows you to find your earbuds with an app. The playtime is a little lesser than others, with 5 hours while the charging time is about 2 hours. Furthermore, the Bose headphones include a dual-mic array that allows you to receive and talk on calls. The Wireless Bluetooth technology supports all kinds of devices to ensure flexibility. Samsung is a popular brand, renowned for its high-quality and reliable components. It should come as no surprise that the Samsung Gear IconX Fitness Earbuds are as reliable and durable. The completely wireless design allows you to freely move and workout at your leisure without any tangles. Samsung truly changes the game with up to 4GB built-in storage so you can store your favorite workout tunes on your earbuds. However, you can also play music via the Bluetooth. Furthermore, the earbuds include easier controls where you merely have to swipe or tap the back of the earbuds to control the music. Another way is through voice commands. You can use Google or Bixby to control your music. These allow you to that allow you to control the music. The best part is that they can be quickly recharged anytime. 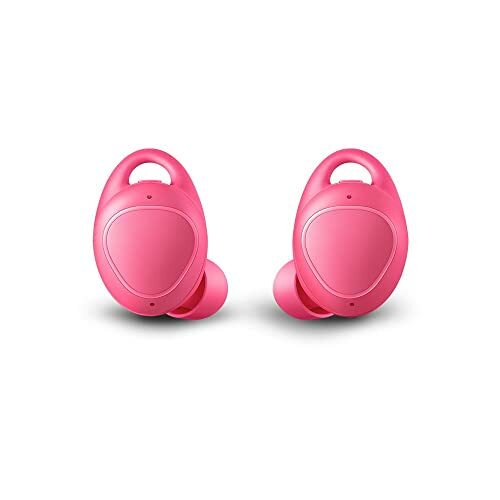 Their play time is about 5 hours for Bluetooth streaming and 7 hours for music listening while the charging time is merely 10 minutes. In fact, they come with carrying case that doubles as a charger to ensure you can charge on the go. Another unique aspect is that the Fitness earbuds track your speed, distance, and calories, helping you with your workouts. 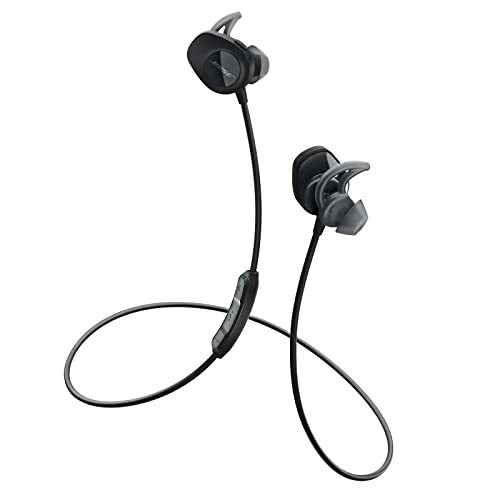 The Jabra Elite Active 65t Earbuds feature truly wireless technology to ensure better stability. The best part is that you don’t need to adjust to fit the Jabra. 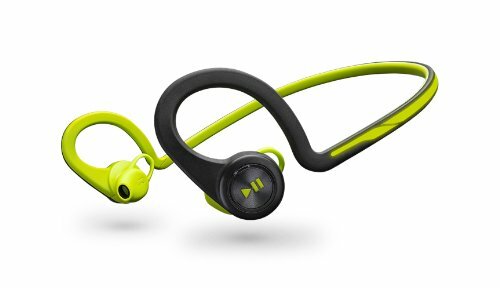 Instead, the Jabra Elite features multiple sizes so you can enjoy a truly customized fit. In addition, it comes with a Sound App that allows you to customize the equalizer so you can hear music in a way you like. 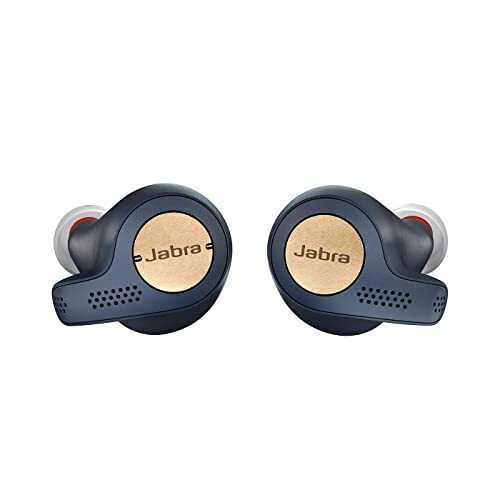 Furthermore, the Jabra Elite Active 65t includes an IP56 rating against dust and sweat resistance to ensure durability and longevity of the device. It has a 2-year warranty in case of any manufacturing defects. What’s more is that it features an integrated motion sensor as well as an accelerometer that enables you to track your performance during workouts. If you thought the Samsung earphones were impressive with 2 mics, then you might be blown away by the 4-mic technology. It ensures clear calls without any noise. The wireless feature, unlike others, is quite stable to minimize any dropped called or connectivity issues. Moreover, the battery lasts for a total of 5 hours. However, it does come with a charging case that allows you to charge the earbuds on the go. The product features multiple voice commands as you can access Alexa, Google Now or Siri with just one touch. While the Treblab J1 Earbuds might not be truly wireless, they still are great workout earbuds. With magnetic technology, the earbuds always stay together so you can store them easily. They also come with a carrying case so you can travel with them anywhere. Furthermore, they include an IPX6 rating against sweat and water. This makes them perfect for outdoor use where you might face a few splashes. The anti-drop ear fins or hooks help secure the earbuds against your ears so they’ll stay in during the hardest of workouts. The best part is that they refuse to compromise on the sound quality. Moreover, the stereo sound and aptX technology ensure a deeper bass and a clearer treble. The noise canceling technology further blocks out any noise or external noise. Also featured is Bluetooth 4.1 connectivity that ensures you stay connected with minimal call drops or music breaks. A built-in mic is included so you can attend calls whenever you want to. The signal range is a strong 33 feet. In addition, they feature an extra-long battery life that allows you to play music constantly for 8 hours. Plus, it takes merely 2 hours to charge. You can pair it with more than one device at a time to make calls or listen to music. In fact, the earbuds come with buttons that allow you to pick up or hang a call. 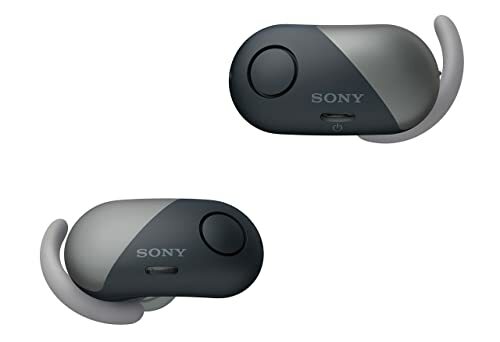 Another truly wireless pair of earbuds, the Sony Wireless earbuds are perfect for sports and workout. They are compatible with all kinds of devices including Android and Apple. 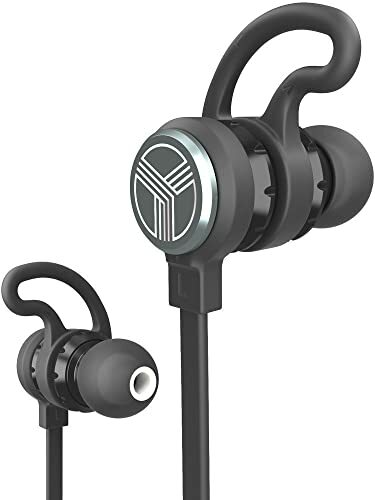 The earphones make use of Bluetooth and NFC connectivity to ensure a stable and secure connection for unlimited music. The best part about these headphones is that they feature digital noise canceling to ensure minimal distractions. Outdoor workouts or working out with a trainer might make it difficult for you to listen to your own music. However, the Ambient Sound Mode ensures that you can blend your music with the environment. Furthermore, the earbuds include an IPX4 rating that easily handles all sweat and water. Not only this, but the headphones deliver the clearest and most powerful sounds with punchy bass, even at high volumes. Moreover, the Sony earphones feature a long battery life of up to 9 hours, which is more than enough for a couple of fitness sessions. In case you forget to charge, you can always charge on-the-go with your charging case. The charging case is lightweight, compact and helps keep your earbuds safe and secure. In addition, the cushioned fit makes it more comfortable for the user to wear them for hours on end. When you are exercising, you need headphones that do not disturb your routine and you can get the most out of them. The Plantronics Wireless headphones let you do just that because of their superior design and excellent quality. They are made to bend which is why they are highly flexible. You can put them on and move your head around in any direction. They will not come off or become lost. If you are doing a tough exercise, these headphones will still stay comfortably on. You don’t have to worry about breakage or any other issue. The speakers are very powerful and in settings where there is too much external noise, you can easily listen to the music clearly. The notes are delivered right through the speakers. The system is such that the music does not stop but only when a call comes. While working out, you won’t have to miss any class either because the headphones provide clear mic quality as well. The design is waterproof and also sweat resistant because when you are exercising you sweat which usually blocks the speaker’s pores. However, with these new headphones, nothing of the sort will happen and you can easily complete your routine. The color of the headphones is green which allows the passers-by to see you at night clearly. You can remain safe and clearly visible while out for a jog at night time. The Aukey Latitude Wireless Headphones are a new brand in the market. They have taken the market by storm because of the excellent production and quality of these items. They are providing you with a chance to listen to the CD-quality music that you cannot do anywhere else. The technology used in these headphones is amazing. It is wireless audio which connects through Bluetooth. So you can connect it with your phone or laptop easily. You do not need a Wi-Fi connection for this to work. You also have a choice to select the kind of music you want to listen to and in which format. The three different options which are available are for your ease and comfort. Sometimes you want to listen to the more raspy tone while other times a soft sound is better. The design of the headphones is very stable and comfortable. They fit any head size and shape. The earbuds are light in weight hence they do not cause your ears to hurt after a while of use. The best thing about these headphones is that you can play music on them for eight straight hours. You do not have to charge them again and again. 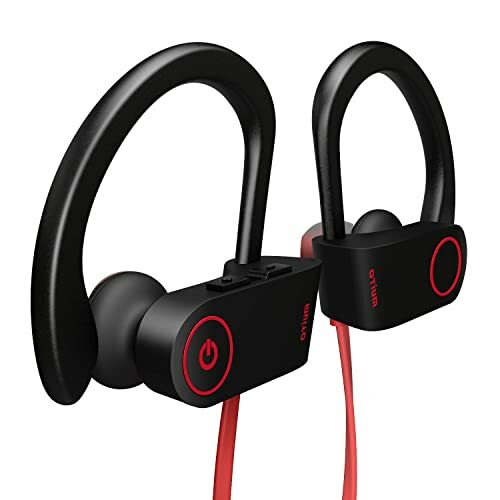 While running, the ears tend to get sweaty but these headphones withstand any resistance and keep the high quality of the music up all the way. These are great for all kinds of outdoor and indoor workouts. What Makes the Best Wireless Earbuds For Working Out? One of the most important factors when choosing earbuds is comfort. Remember, you’ll be using them for a long time and while doing intense exercise and training. This can often involve jumping, running, cycling and other movements. However, if your headphones are not comfortable, you might end up resenting the workout. Always test out the earphones and how comfortable they sit on your ears. Also, check for the fit! If they are too big, they might fall out often or might chafe your ears. With wireless earphones, it’s especially hard as they come with ear hooks that might be uncomfortable. The best way to go is with adjustable earphones that allow you to customize the ear hooks. Some earbuds also come with three sizes of buds so you can choose ones that are closest to you. Since you’ll be performing some high-intensity workout, it is important that your earbuds are sweatproof. Sweat resistance can help protect the internal components of the earbuds from water and sweat. Most earbuds, specifically tailored for workouts, are mostly sweat resistant or sweat proof. Some are also splash resistant or waterproof. IPX- X signifies that there is no rating on solid protection or dust protection. In case there’s a digit instead of X, this means the earbuds are also dust-proof. 7, 8 & 9: Immersion, waterproof up to certain depths. If you’re investing money into your earbuds, ensure that they last you a long time. Most times, this includes sweat resistance and water resistance as they help protect the earbuds. However, the materials make the major contribution to the durability. Mostly, we recommend going through user reviews to find out how long the earbuds lasted them. Check the manufacturer’s website for the materials and how well they hold up in tests. You might bang them or drop them a lot during workouts. This is where truly wireless earbuds might fail you. The ones with a neckband allow you to keep track of the headphones while ensuring they never fall off. These tend to last much longer. Imagine cycling at high speeds while listening to your favorite music. However, the wind might affect the music as it contributes to a lot of noise. Apart from cycling, even if you’re at a gym, the constant noise might distract you. Thus, we recommend that you go for noise canceling headphones that allow you to listen to your music. If not noise-canceling, then at least go for ones that effectively reduce the noise of the wind. This ensures that you can enjoy your music in peace without constant distractions. This is also true for the other side. Nobody wants to be distracted by your music. Ensure that the earbuds isolate the sound so no one but you can hear the sound. Since you’ll be going wireless, your earbuds should always have a stable connection. The Bluetooth technology plays a huge role in this regard. For example, Bluetooth 4.0 might not be as stable as 4.1. On the other hand, you might want to connect through NFC for a more stable connection. Whatever the case, ensure that there are as few breaks and skips as possible. Also, you might be working for hours on end, ensure that the battery lasts for more than 5 hours. This way, you won’t have to worry about working out without music because your battery died. There’s no point in having a wide variety of features if the sound quality is going to be low. For workouts, the bass is imperative as it produces the right rhythm and beat for exercise. Ensure that the headphones you buy allow for clear sounds as well as a punchy bass. Another aspect you need to consider is the stereo sound. Are Wireless Workout Earbuds Better than Wired? A huge debate in the audio world seems to be Wired vs Wireless. With people gravitating towards the wireless earbuds, manufacturers are forced to amp up the quality of these headphones. However, are they really so great? Well, the Bluetooth technology has come far from its initial days. The connection is now much more stable with fewer cuts and breaks. The best part is that you can say goodbye to tangles. The no-hassle design and the freedom of movement are the major selling point for wireless earbuds. They can help you perform a variety of jobs including working out without worrying about wires. Your phone doesn’t have to be on your person as well. You can easily set them up in a secure location and workout to your heart’s desire. However, the major complaint seems to be the battery. These earbuds need a battery to operate and thus need to be charged. This reduces the longevity as the battery life decreases with use. With the wired variety, all you had to do was plug them in and play. All in all, Bluetooth wireless headphones might have their flaws, but their advantages certainly outweigh them. Overall, our 8 top best wireless earbuds for working out are bound to catch your attention. These ensure that you can work out with your favorite music without any hassles. While you may have to take care of the charging, the wireless technology is sure to never fail you. So, ready to test them out yourself?